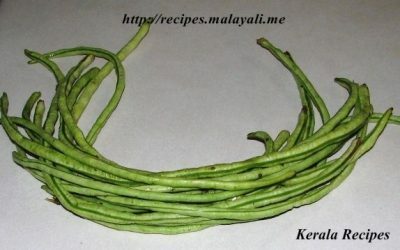 Long Bean is known as Achinga Payru or Pacha Payru in Malayalam. Another common name for Long Bean is Yard Long Bean. It can be light green, dark green or purple in color. Tender Achinga has a wonderful taste when stir fried. When the bean is no longer fresh and becomes soggy, the seeds are separated from the skin and cooked. I remember my childhood summer holidays, when I used to help my grandparents in picking fresh Farm Grown Long Beans. It was such a delight running around and searching for fully grown beans. Those fresh crisp beans used to have a very yummy taste when cooked on low heat. I was searching for Achinga after coming to US but the ones I used to find in Indian Stores and Farmers Market where not tender and crisp. Hence, I never bought Long Beans. My husband likes Achinga and he ended up buying a bunch of long beans last Sunday and here is my recipe for a simple Long Bean Stir Fry or Achinga Mezhkkupuratti. This is my entry to My Legume Love Affair – Twelfth Helping hosted by Annarasa and created by Susan of the Well Seasoned Cook. 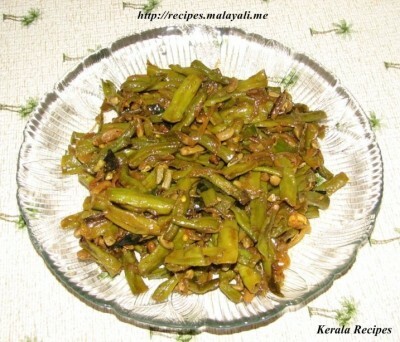 Cut the tender long beans/achinga into 1″ long pieces. If the beans are not fresh and appear soggy, take out the seeds and throw the skin. Add curry leaves and green chillies and saute for a few minutes till the onions begin to brown. Add a pinch of turmeric and chilly powder and fry for a minute. Add the chopped long beans along with salt and combine everything. Open the lid and stir the contents. Cover and continue to cook on low heat for another 5 minutes till the beans are almost cooked. Open the lid and allow excess water to evaporate. Increase the heat and stir fry for another 2 minutes.